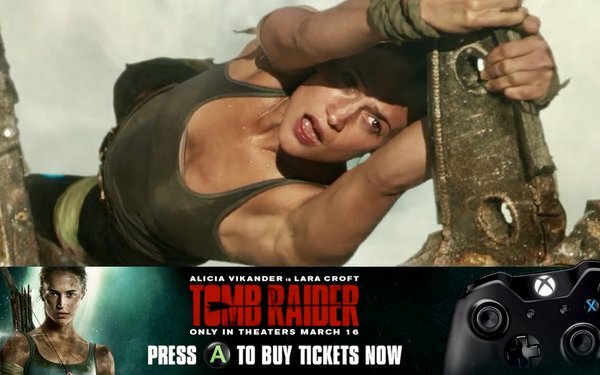 Warner Bros/MGM and its agency, OMD, wanted to try a new form of television advertising for its film, "Tomb Raider." Traditional TV ads for films end with "in theaters starting [date]" or "check local movie times"; i.e., a generic tag that forces viewers to search elsewhere for movie times and locations. BrightLine created a first-of-its-kind way to shop—directly from the consumers’ television screens. “T-Commerce: Movie Tickets” premiered on Hulu, where viewers encountered a movie trailer for the Warner Bros./MGM film "Tomb Raider" while watching their selected content. They were given the opportunity to select a desired show time and to purchase tickets to see the film at a local theater, using their remote control. The sophisticated and cutting-edge TV technology instantly geo-located the viewer and smartly displayed the home's closest theaters and show times. Viewers were able to browse and compare available show times, by theater. Upon selecting the desired theater time and location, the viewer pointed and clicked to confirm purchase, then instantly received an SMS or email to complete the transaction and access the tickets on a mobile phone. This innovation was made possible by leveraging BrightLine's advanced TV advertising platform, InCast, as well as Fandango’s deep theater footprint and Hulu’s large user footprint. The new product combined an array of sophisticated technologies, including: TV ad interactivity, dynamic API-driven creative, addressable ad messaging, e-commerce integration, and place-shifting. The T-commerce ad product was designed to be modular, allowing any e-commerce platform to be plugged in for a vast array of use cases and clients. Results indicate a positive future for this kind of advertising, turning the TV screen into a POP opportunity. Make the process of going to the movies seamless by allowing consumers to search their local theaters for showings and times and buy tickets.